On November 18, 1904, engineer B.M. Hall submitted his final report to the 12th National Irrigation Congress in El Paso, Texas. He concluded that the ideal location for a dam and reservoir would be a site in western New Mexico. 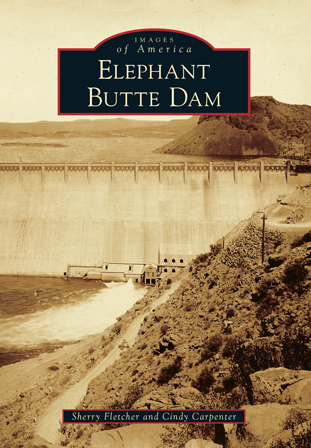 A congressional act of February 25, 1905, authorized the construction of Elephant Butte Dam, the first civil engineering structure concerned with international allocation of water. Part of the Rio Grande Project, the dam and its reservoir would provide irrigation water for farmers along the Rio Grande in New Mexico, Texas, and Mexico. Today, Elephant Butte Dam is designated as a National Historical Engineer Landmark by the American Society of Civil Engineers (ASCE), the oldest national professional engineering society in the United States. The area is home to Elephant Butte Lake State Park, where camping, fishing, and water sports are enjoyed by both residents and tourists. Historian Sherry Fletcher has shared with the readers her collection, including rare original photographs and documents from engineer Laverne Charles, acting chief of construction on the Elephant Butte Dam Project. Fletcher and coauthor Cindy Carpenter have captured the history of the dam from its inception to completion in 1916 through photographs, historical documents, and old newspapers.